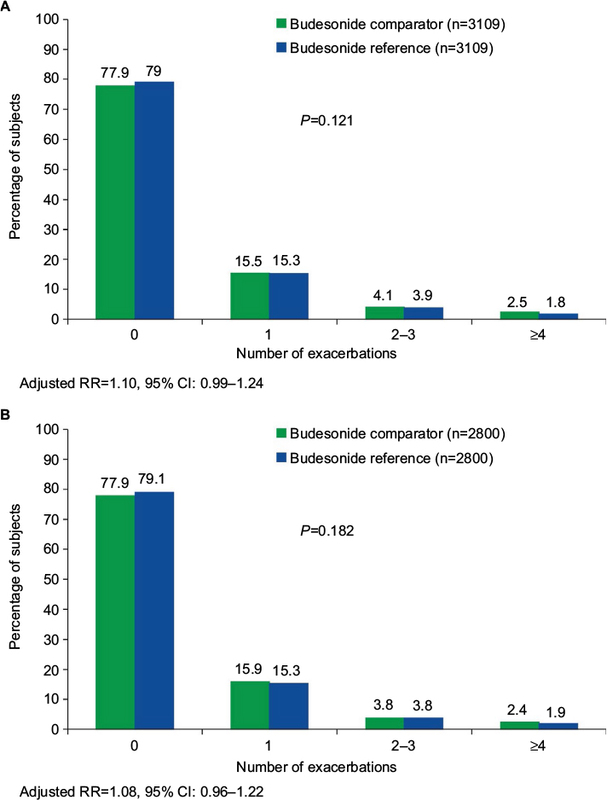 Objective: The objective of this study was to determine whether the effectiveness of budesonide comparator is non-inferior to budesonide reference in the prevention of asthma exacerbations. Asthma-related hospitalizations and safety were also examined. Methods: This study used a matched, historic cohort design. Data were drawn from the Clinformatics™ Data Mart US claims database and included a 1-year baseline, starting 1 year before the index prescription date, and a 1-year outcome period. Patients received budesonide comparator or reference treatment. The primary outcome was the rate of asthma exacerbations. Non-inferiority for budesonide comparator vs budesonide reference was established if the 95% confidence interval (CI) upper limit of mean difference in proportions between treatments was <15%. Secondary outcomes examined rate of asthma-related hospitalizations and adverse events (AEs). Results: The budesonide comparator and reference-matched cohorts each included 3109 patients. The adjusted upper 95% CI for the difference in proportions of patients experiencing asthma exacerbations was 0.035 (3.5%), demonstrating non-inferiority. Cohorts did not significantly differ in the rate of asthma exacerbations (adjusted rate ratio [RR]=1.04, 95% CI: 0.95–1.14) or rate of asthma-related hospitalizations (adjusted RR=1.10, 95% CI: 0.99–1.24) after adjusting for baseline confounders. No asthma exacerbations occurred during the outcome period in 72.9% of budesonide comparator patients and 71.8% of budesonide reference patients. No asthma-related hospitalizations occurred in 77.9% of patients in the budesonide comparator cohort and 79.0% of patients in the budesonide reference cohort. The most frequent AEs were throat irritation (≤0.4% of patients) and hoarseness/dysphonia (0.02% of patients). AEs did not significantly differ between treatment cohorts. Conclusion: In this real-life study, non-inferiority of the budesonide comparator vs reference was met for the primary end point of asthma exacerbation rates. Asthma-related hospitalization and AE rates did not differ between the two treatment cohorts. The budesonide comparator is an effective and safe treatment alternative for asthma exacerbations. The budesonide comparator (Budesonide Steri-Neb™; Teva Pharmaceuticals, Inc., Sellersville, PA, USA) is a generic version of the budesonide reference with the same active ingredient and was similarly approved in many countries for the treatment of asthma in 2009.17 The availability of a lower-cost treatment with efficacy equivalent to the budesonide reference would have potential economic benefit in reducing the cost of asthma care. Asthma exacerbations represent a transient and increased worsening of asthma symptoms and are also associated with pulmonary function decline, reduced health status, and possibly premature mortality.18 Asthma exacerbations and hospitalizations are associated with significant morbidity, are important end points for the assessment of treatment, and are the major drivers of the overall cost of asthma care.19,20 The current study examined the real-life clinical management of US patients with asthma using a historic cohort study of patients enrolled in a health care claims database. The objective of this study was to determine whether the budesonide comparator is non-inferior in effectiveness to the budesonide reference in patients with asthma. Budesonide comparator vs reference safety was also examined. The study used the Clinformatics™ Data Mart (CDM) database, an anonymous patient longitudinal database (US observational data), that contains retrospective claims data (2000–2012) from an employed, commercially insured population that includes >45 million people. The database contains medical claims (primary care and secondary care), pharmacy claims, laboratory results, and pricing information. 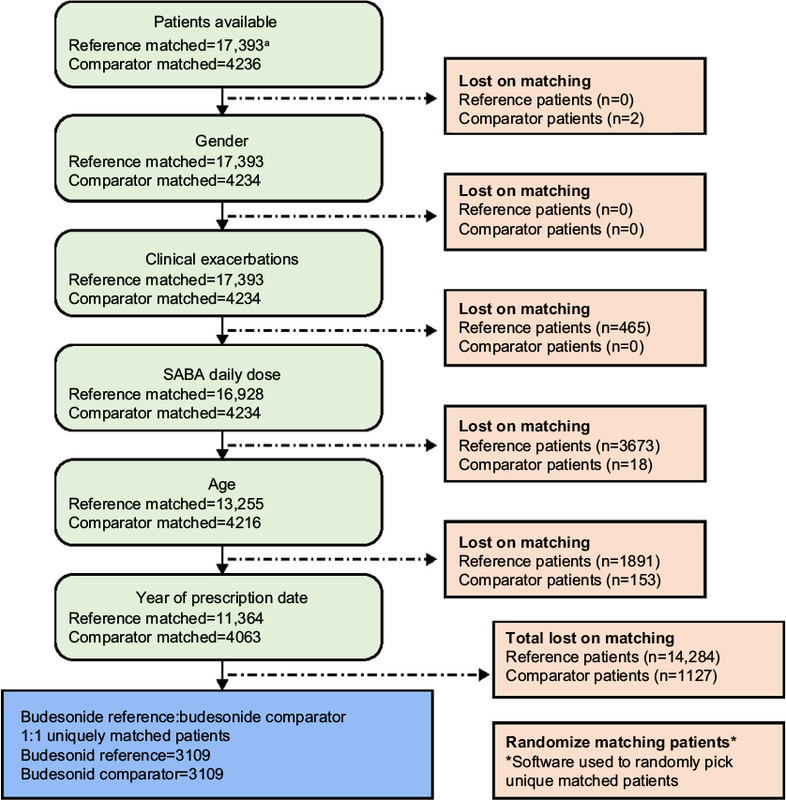 A matched (1:1), historic cohort design was used to compare the budesonide comparator treatment cohort to the budesonide reference treatment cohort (Figure 1). The budesonide comparator cohort included two groups of patients: initiation patients and change patients. The initiation patients were not prescribed corticosteroid nebulizers during baseline and received their first prescription for the budesonide comparator at the index prescription date. The change patients were using budesonide reference (250, 500, or 1000 µg/2 mL) during baseline and changed treatment to budesonide comparator (250 or 500 µg/2 mL) at the index prescription date. The budesonide reference cohort also included two groups of patients: initiation patients and continuation patients. Initiation patients were not prescribed corticosteroid nebulizers during baseline and received their first prescription for budesonide reference at the index prescription date. The continuation patients were on budesonide reference (250, 500, or 1000 µg/2 mL) at baseline and continued treatment with budesonide reference at the index prescription date. The budesonide reference continuation patients may have been included more than once within the cohort with different index prescription dates if they satisfied the inclusion/exclusion criteria (see Inclusion and exclusion criteria section), including 2 years of continuous data (1 year before and 1 year after the index prescription date). However, the matching process ensured that only unique patients were randomly selected from all cohorts and included in the analyses. Notes: aPatients may be included more than once in the budesonide reference continuation patient group if their index prescription date satisfied the criterion of 2 years of continuous data (1 year before and 1 year after the index prescription date). However, during the matching process, it was ensured that only unique patients were analyzed. Abbreviation: ICS, inhaled corticosteroid. The study period included a baseline period and an outcome period (Figure 1). The baseline period was 1 year before and including the index prescription date. The index prescription date was the date patients with no baseline budesonide nebulizer treatment received the first prescription for reference or comparator budesonide (initiation patients), the date patients with baseline budesonide reference treatment received the first prescription for budesonide comparator (change patients), or the date patients with baseline budesonide reference treatment continued budesonide reference prescriptions (continuation patients). The outcome period was the 1-year period following the index prescription date. The analysis included CDM data entered from November 2008 (FDA approval date of budesonide comparator in the US) until the last available data included in the CDM (September 2012) to ensure that the patient cohorts received treatment within a similar time frame. The study protocol was registered with the European Network of Centres for Pharmacoepidemiology and Pharmacovigilance (ENCePP; ENCePP/SDPP/7648). The analyses and the dissemination of the results were conducted in accordance with the Respiratory Effectiveness Group (REG) standards21 and the ENCePP Code of Conduct. Patients whose records were included in the analysis had a diagnosis for asthma using the International Classification of Diseases, Ninth Revision; Clinical Modification (ICD-9-CM; code 493 except codes 493.20–493.22 and 493.81), were aged 1–80 years (adult population: 12–80 years; pediatric population: ≥1 and <12 years), and had 2 years of continuous practice data, including 1 year prior to (baseline) and 1 year following (outcome) the index prescription date. Patient records were excluded from the analysis if information retrieved provided evidence of chronic respiratory diseases other than asthma (as determined by ICD-9 code, shown in Table S1) or evidence that patients had received prescriptions for inhaled corticosteroid (ICS) nebulizers other than budesonide reference in the baseline period. Use of other respiratory drugs, including use of ICS not delivered by a nebulizer device, during baseline was evaluated as a matching criterion, which is described in the Statistical analysis section. The primary outcome was the rate of ATS/ERS-defined asthma exacerbations23 during the outcome period. ATS/ERS asthma exacerbations were defined as asthma-related emergency department (ED) visits, inpatient hospitalizations, and/or a prescription for an acute course of oral corticosteroids resulting from a lower respiratory event (diagnosis and procedure codes are shown in Tables S2 and S3). Acute courses of oral corticosteroids were defined as all courses where dosing instructions suggest exacerbation treatment (eg, 6000, 5000, 4000, 3000, 2000, 1000 reducing, or 30,000 μg as directed) and/or all courses unlikely to be maintenance therapy, ie, with no dosing instructions but recorded within a ±5-day window from a lower respiratory event. Lower respiratory events included asthma-related ED visits, hospital admissions, ambulatory visits, or respiratory investigations (Table S3). Secondary outcomes included the rate of asthma-related hospitalizations (defined as ED visits or inpatient admissions) and the rate of adverse events (AEs). 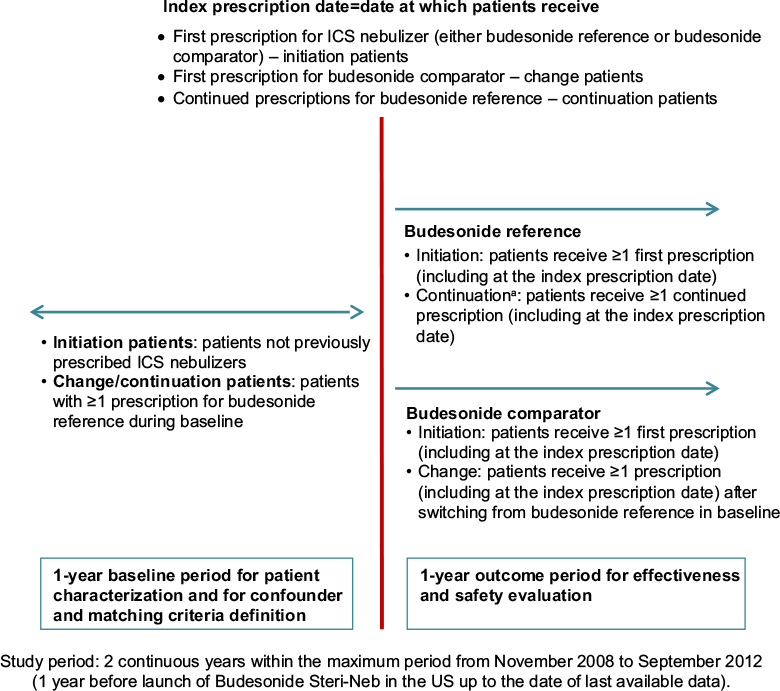 The budesonide comparator and budesonide reference Summary of Product Characteristics (SPC)/Prescribing Information17,25 were used to generate a list of possible AEs to search for within the CDM database. The AEs identified in the database using the SPC-listed AEs serve as proxies for possible AEs. The presence of an AE within the database indicates that the patient had a consultation related to the AE. The SPC-listed potential AEs were identified in the database as ICD-9-CM codes. The AEs were classified by using the Medical Dictionary for Regulatory Activities (MedDRA) system organ class (SOC) for comparison of the budesonide comparator and budesonide reference cohorts. Pearson’s and Spearman’s correlation coefficients (as appropriate) were calculated between all baseline variables to determine strengths of linear relationships between them. The correlation coefficients were considered in conjunction with clinical interpretation to identify pairings of variables that may have presented co-linearity issues at the modeling stage. Where variables were considered to be co-linear, the most appropriate variable in the pairing was selected, based on clinical and statistical interpretation. Multivariate analyses were carried out using the full dataset to identify baseline variables that were predictive (P<0.05) of outcomes. These were considered potential confounders when modeling the outcome variables. Based on differences identified through exploratory analysis of baseline variables and predictive modeling of the baseline data in relation to the primary outcome variable (independent of treatment group), individual patients from the comparator and reference budesonide cohorts were matched to ensure the comparison of similar patients as in previous studies from our group.26,27 Exact matching for categorical variables and coarsened exact matching for numeric variables were used to match patients using 1:1 nearest neighbor matching, without replacement. Budesonide reference initiation patients were matched with budesonide comparator initiation patients, and budesonide reference continuation patients were matched with budesonide comparator change patients who switched from budesonide reference during baseline to budesonide comparator during the outcome period. The exact matching approach was defined a priori and used a predefined set of key matching criteria rather than propensity score matching.21 Exact matching on clinically relevant variables was used to ensure that the comparator and reference patient cohorts would be treated similarly in clinical practice, given the emphasis on variables considered central to making treatment decisions. Thus, the comparator and reference budesonide cohorts were characterized according to demographic characteristics; comorbidities; co-medications; prior respiratory therapy, including inhaler use; number of exacerbations; antibiotic treatment for lower respiratory events; and asthma control in the year prior to the index prescription date. The final matching criteria included gender (male, female), age (<12±1 years; ≥12±5 years), average year of index prescription date (±1 year), exacerbations during the baseline period (0, 1, 2, and ≥3 years), and baseline prescribed SABA average daily dose (0, 1–100, 101–200, 201–400, and >400 μg), calculated as count of inhalers multiplied by doses in pack divided by 365 and multiplied by microgram strength. Additionally, patients were matched for asthma control in the year before their index prescription date for budesonide comparator or reference. Asthma control was defined using composite measures of key elements of asthma control from the database, as done previously.24,27,28 Risk-domain asthma control was defined as the absence of clinical asthma exacerbations (ie, no ATS/ERS-defined exacerbations and no prescription for antibiotics from a lower respiratory event) and no outpatient department visits. Overall asthma control was defined as risk-domain asthma control and average daily dose of ≤180 μg albuterol. 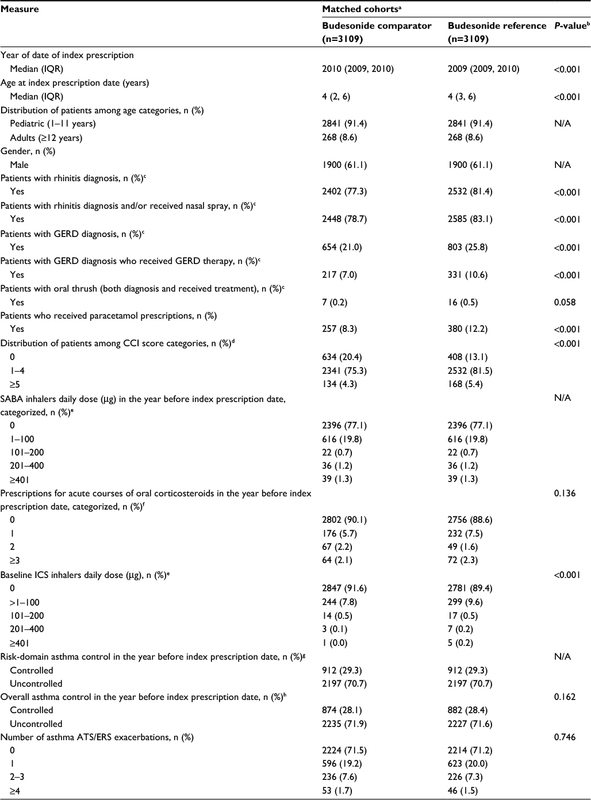 The power analysis was based on the finding from a previous study that 26.1% of asthma patients (2019 out of 7734) using ICS had at least one exacerbation in the 1-year period after initiation.24 For the primary end point, the sample size required for adequate statistical power with a one-sided 0.05 significance level was 2172 patients in each cohort. Previous randomized clinical trials evaluating the efficacy and safety of budesonide have reported a 20% difference between treatment groups to be clinically significant;29,30 to ensure a clinically significant outcome, a more stringent 15% limit was used in this study. Taken together, this enabled 90% power to show that there was no statistical difference between groups when the 95% confidence interval (CI) upper limit of mean difference in proportions between treatments was <15%. For the primary outcome, non-inferiority for budesonide comparator vs reference was established if the 95% CI upper limit of mean difference in proportions between treatments in the rate of ATS/ERS-defined asthma exacerbations was <15%. Conditional Poisson regression models used empirical standard errors for more conservative CI estimations and adjusted for potential baseline confounders. Rates of exacerbations and AEs were compared between cohorts using conditional logistic regression models adjusted for potential baseline confounders and presented as rate ratios (RRs) with 95% CIs. Analyses are presented for the whole cohorts of budesonide comparator and budesonide reference, and sensitivity subanalyses are presented for the budesonide comparator and reference initiation patients only. Patient cohort placement was determined by one or more prescriptions for either budesonide comparator or reference, and all study analyses were intention-to-treat analyses. 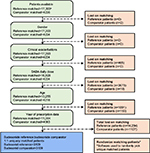 The flow chart summarizing patient selection is shown in Figure 2, and the cohort matching process is shown in Figure 3. The process was initiated with records of 37,468 patients who received budesonide reference and records of 65,519 patients who received budesonide comparator. After evaluation of records with inclusion/exclusion criteria, records of 17,393 budesonide reference prescriptions (8780 unique patients) and 4450 patients treated with budesonide comparator were selected for matching. The matching process resulted in retention of records of 3109 patients who received budesonide reference and 3109 patients who received budesonide comparator. Figure 2 Patient selection flow chart for patients whose records were included in the budesonide reference (A) and budesonide comparator (B) cohorts. Notes: aPatients may be included more than once in the budesonide reference continuation patient group if their index prescription date satisfied the criterion of 2 years of continuous data (1 year before and 1 year after the index prescription date). The number of unique participants in the budesonide reference cohort is 8780. Abbreviations: ICS, inhaled corticosteroid; Rx, prescription. Figure 3 Patient matching flow chart for patients whose records were included in the budesonide reference and budesonide comparator cohorts. Notes: aPatients may be included more than once in the budesonide reference continuation patient group if their index prescription date satisfied the criterion of 2 years of continuous data (1 year before and 1 year after the index prescription date). Number of unique participants in the budesonide reference cohort is 8780. The matching process ensured that only unique patients were randomly selected from all cohorts and included in the analyses. Demographic and clinical characteristics of the matched budesonide reference and comparator cohorts during baseline are summarized in Table 1 (baseline characteristics of the unmatched patient cohorts are shown in Tables S4–S6). The study population included mostly pediatric patients with the median age of 4 years for both cohorts. The majority of patients in both cohorts were males (61.1%) and had a diagnosis of allergic rhinitis (77%–81%). Approximately 23% of patients in both cohorts were prescribed SABAs. Prescriptions for acute courses of oral corticosteroids during baseline occurred in ~10% of the budesonide comparator cohort and 11% of the budesonide reference cohort. There were very few baseline AEs, likely due to the low median age of the population. No significant differences between cohorts were observed for baseline AEs by SOC or by individual AEs. Notes: aCohorts matched on gender, age (<12 [±1 year]; ≥12 [±5 years]), average year of index prescription date (±1 year), baseline “clinical” exacerbations (0, 1, 2, and ≥3), and baseline SABA daily dose (categorized). bP-value based on conditional logistic regressions. cThrough GP visits in the study period (2008–2012). ICD-9 codes used for comorbidities: rhinitis, 472.0 or 477; GERD, 530.81; and oral thrush, 1120. dCalculated using the CCI (using ICD-9 codes) over the 1 year prior to and including the index prescription date. eDaily dose was calculated as count of inhalers multiplied by doses in pack divided by 365 and multiplied by microgram strength. fAll courses where dosing instructions suggest exacerbation treatment (eg, 6000, 5000, 4000, 3000, 2000, 1000 reducing, or 30,000 μg as directed) and/or all courses unlikely to be maintenance therapy, ie, with no dosing instructions but recorded within a ±5-day window from a lower respiratory event. gRisk-domain asthma control defined as the absence of asthma “clinical” exacerbation (ie, ATS/ERS exacerbation [asthma-related ED or inpatient hospital admission or prescription for an acute course of oral steroids from a lower respiratory event] or prescription for antibiotics from a lower respiratory event) and outpatient department attendance. hOverall asthma control defined as risk-domain asthma control and average daily dose of ≤180 µg albuterol. Abbreviations: ATS/ERS, American Thoracic Society/European Respiratory Society; CCI, Charlson Comorbidity Index; ED, emergency department; GERD, gastroesophageal reflux disease; GP, general practitioner; ICD-9, International Classification of Diseases, Ninth Revision; ICS, inhaled corticosteroid; IQR, interquartile range; N/A, not available; SABA, short-acting β2-agonist. In the year before and including the index prescription date for budesonide comparator or budesonide reference, risk-domain asthma control and overall asthma control did not significantly differ between cohorts (Table 1). 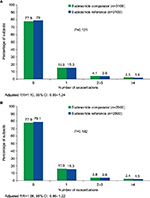 Risk-domain asthma control (ie, no clinical asthma exacerbations and no outpatient department visits) was shown in 29.3% (912/3109) of the budesonide comparator cohort and 29.3% (912/3109) of the budesonide reference cohort. Overall asthma control (ie, risk-domain asthma control and albuterol average daily dose ≤180 µg) was achieved in 28.1% (874/3109) of the budesonide comparator cohort and 28.4% (882/3109, P>0.1) of the budesonide reference cohort. The budesonide comparator was non-inferior to the budesonide reference for the primary outcome of rate of ATS/ERS-defined asthma exacerbations during the outcome period, with an adjusted upper 95% CI for the difference in proportions for budesonide comparator vs budesonide reference of 0.035 (3.5%) for the whole cohort analysis, which was below the non-inferiority criterion of <15%. For the sensitivity subanalysis of the initiation patients, the adjusted upper 95% CI for the difference in proportions for budesonide comparator vs budesonide reference also was 0.035 (3.5%). Additionally, there was no significant difference in the rate of ATS/ERS-defined asthma exacerbations (adjusted RR=1.04, 95% CI: 0.95–1.14) between the budesonide comparator and reference cohorts after adjustment for baseline confounders (Figure 4A). Most of the patients in each cohort (72.9% for budesonide comparator and 71.8% for budesonide reference) had no ATS/ERS-defined exacerbations. The sensitivity subanalysis of initiation patients was consistent with the whole cohort analysis and showed no significant difference between cohorts (adjusted RR=1.04, 95% CI: 0.95–1.14; Figure 4B). In the initiation patient groups, 72.9% of patients in the budesonide comparator group and 71.5% of patients in the budesonide reference group had no ATS/ERS-defined exacerbations. Figure 4 ATS/ERS-defined asthma exacerbations in the matched comparator and reference budesonide whole cohorts (A) and in the initiation patients (B). 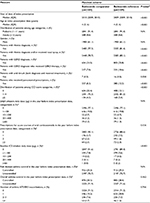 Notes: Budesonide comparator and reference treatment cohorts matched for gender, age (<12 [±1 year]; ≥12 [±5 years]), average year of index prescription date (±1 year), baseline clinical asthma exacerbations (0, 1, 2, and ≥3), and baseline SABA daily dose (categorized). Whole cohorts analysis (A) adjusted for baseline exacerbations (ATS/ERS definition; categorized), age, and CCI score. Subanalysis of initiation patients (B) adjusted for baseline exacerbations (ATS/ERS definition; categorized) and age. Abbreviations: ATS/ERS, American Thoracic Society/European Respiratory Society; CCI, Charlson Comorbidity Index; CI, confidence interval; RR, rate ratio; SABA, short-acting β2-agonist. The budesonide comparator and reference cohorts did not significantly differ in the rate of asthma-related hospitalizations during the outcome period (adjusted RR=1.10, 95% CI: 0.99–1.24) after adjustment for baseline confounders (Figure 5A). There were no asthma-related hospitalizations in 77.9% of patients in the budesonide comparator cohort and 79.0% of patients in the budesonide reference cohort. The sensitivity subanalysis of the budesonide comparator and reference initiation patients was consistent with the whole cohort analysis and showed no significant difference between groups (adjusted RR=1.08, 95% CI: 0.96–1.22). There were no asthma-related hospitalizations in 77.9% of patients in the budesonide comparator initiation group and 79.1% of patients in the budesonide reference initiation group (Figure 5B). Figure 5 Asthma-related hospitalizations in the matched comparator and reference budesonide whole cohorts (A) and in the initiation patients (B). Notes: Budesonide comparator and reference treatment cohorts matched for gender, age (<12 [±1 year]; ≥12 [±5 years]), average year of index prescription date (±1 year), baseline clinical asthma exacerbations (0, 1, 2, and ≥3), and baseline SABA daily dose (categorized). Whole cohorts analysis (A) adjusted for baseline hospitalizations (categorized) and paracetamol use. Subanalysis of initiation patients (B) adjusted for baseline hospitalizations (categorized) and paracetamol use. Abbreviations: CI, confidence interval; RR, rate ratio; SABA, short-acting β2-agonist. Owing to the overall low numbers of AEs, RRs were not evaluated by SOC in the matched cohorts (AEs by SOC for unmatched patients are shown in Table S6). Instead, individual AEs were used for the whole cohort RR analyses (Table 2; data for unmatched cohorts are provided in Table S6). The most frequent AEs during the 1-year outcome period were throat irritation (0.2% for budesonide comparator vs 0.4% for budesonide reference) and hoarseness/dysphonia (0.2% for each cohort). No significant differences between the treatment cohorts were found for the individual AEs. 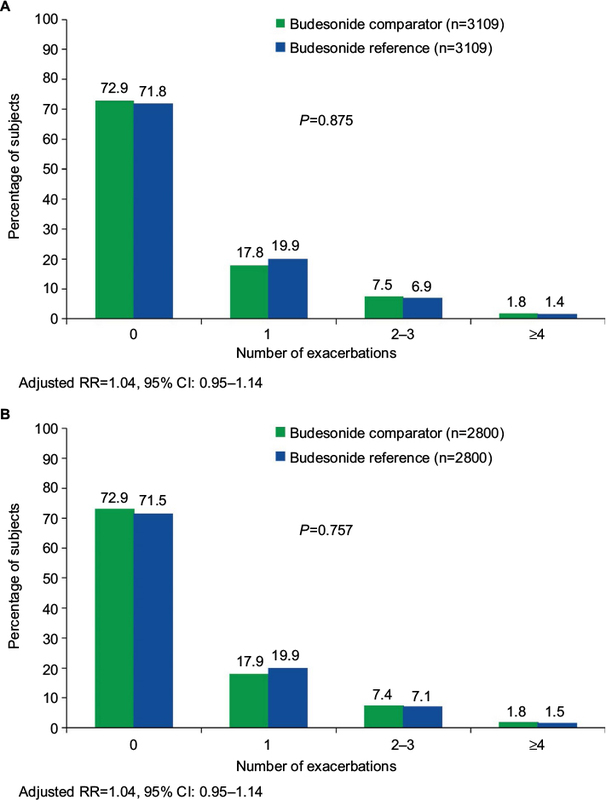 Additionally, there was no significant difference between the budesonide comparator and reference cohorts in the report of any AE (combined across individual AEs) for the whole cohort analysis (adjusted RR=0.71, 95% CI: 0.27–1.85, adjusted for age, year at index prescription date (±1 year), gastroesophageal reflux disease (GERD) diagnosis/therapy, and categorized CCI score) or the sensitivity subanalysis of initiation patients (adjusted RR=0.62, 95% CI: 0.23–1.65, adjusted for average year of index prescription date (±1 year), GERD diagnosis/therapy, and categorized CCI score) after adjustment for baseline confounders. Notes: aCohorts matched on gender, age (<12 [±1 year]; ≥12 [±5 years]), average year of index prescription date (±1 year), baseline clinical asthma exacerbations (0, 1, 2, and ≥3), and baseline SABA daily dose (categorized). bP-value based on conditional logistic regressions. Abbreviations: AEs, adverse events; SABA, short-acting β2-agonist. Strengths of the current study include the examination of real-life treatment outcomes in patients with asthma within a large database of commercially insured patients in the US. Studies that examine real-life clinical database treatment outcomes are an important complement to the findings from randomized clinical trials that typically enroll highly selected patient populations, thereby limiting the generalizability of the trial findings.38,39 Real-life clinical database studies, such as the current study, enroll large, diverse patient populations that represent actual clinical practice treatment management that is generalizable to a broader population of patients. The current study was conducted according to REG methodological standards.21 To ensure patients were characterized using all potentially relevant variables and that the central outcomes of interest could be assessed, the plan for statistical analysis, the study population, and the asthma-related outcomes of interest were determined prior to any analysis of the database. Furthermore, the large database allowed matching of patient cohorts on baseline potential confounding variables. As with all database studies, there are limitations associated with internal validity and possible confounding factors. Additionally, there is a possibility of coding inconsistencies or errors, although differential effects on the cohorts are not expected. The patients examined in the study received commercial insurance associated with employment, and caution should be taken if generalizing findings to patients who receive government-provided health care, such as Medicaid. Additionally, characteristics of the patient population included in this real-world study may limit generalization of study findings to adults or patients with frequent exacerbations. The AEs reported in the current study were selected from the budesonide comparator and reference SPC and are substitutions for potential AEs. The actual AEs in response to treatment cannot be specifically identified in the database. Instead, the reported AEs indicate that the patient had a consultation related to the AE, but whether the treatment or another underlying condition resulted in the AE is not known. Thus, although the AE rates reported in the current study were low, they are likely to be overreported. Consistent with a real-world approach and safety analysis, the patient cohorts were derived using intention-to-treat analyses based on one or more prescriptions for either budesonide comparator or reference. While allowing examination of a real-life varied respiratory cohort, this approach may have attenuated differences in outcomes between cohorts. Given the inherent limitations of database studies even with matched treatment groups, the study results should be viewed in conjunction with those from other reports, particularly randomized controlled trials. In this real-life, matched cohort study, the budesonide comparator met the non-inferiority criterion for asthma exacerbation rates, as defined by ATS/ERS criteria. Additionally, there were no differences between comparator or reference budesonide for rates of asthma-related hospitalizations or AEs. Therefore, the budesonide comparator is an effective treatment option for prevention of asthma exacerbations. Given the high costs associated with the management of persistent asthma, the availability of the budesonide comparator as a lower cost generic treatment alternative with equivalent effectiveness provides potential economic benefit in reducing the cost of asthma care. The authors thank Robert Rhoades, PhD, and Lynanne McGuire, PhD, of MedVal Scientific Information Services, LLC, for providing medical writing and editorial assistance and Priyanka Raju Konduru of Observational and Pragmatic Research Institute Pte Ltd (OPRI) for assistance with data extraction. This manuscript was prepared according to the International Society for Medical Publication Professionals’ Good Publication Practice for Communicating Company-Sponsored Medical Research: GPP3. Medical writing assistance was provided by MedVal Scientific Information Services, LLC, and was funded by Teva Branded Pharmaceutical Products R&D, Inc. (Frazer, PA). Teva provided a full review of the article. Funding for this study was provided by Teva Branded Pharmaceutical Products R&D, Inc. (Frazer, PA). DBP, CM, GG, RM, VT, and SWYM contributed toward study concept and design. All authors involved in acquisition, analysis, or interpretation of data. All authors participated in drafting of manuscript. All authors made critical revisions of manuscript for important intellectual content. VT contributed toward statistical analysis. All authors gave the final approval of manuscript. CM, RM, and VT were employed by OPRI at the time of the study; CM was a project leader. SWYM is an employee of OPRI. OPRI conducted this study and has conducted paid research in respiratory disease on behalf of the following other organizations in the past 5 years: Aerocrine, AKL Research and Development Ltd, Almirall, AstraZeneca, British Lung Foundation, Boehringer Ingelheim, Chiesi, GlaxoSmithKline, Meda, Mundipharma, Napp, Novartis, Orion, REG, Takeda, Teva Pharmaceuticals, and Zentiva, a Sanofi company. EG is an employee of Teva Pharmaceuticals. GG was an employee of Teva Pharmaceuticals during the time of the study. DBP has board membership with Aerocrine, Amgen, AstraZeneca, Boehringer Ingelheim, Chiesi, Meda, Mundipharma, Napp, Novartis, and Teva Pharmaceuticals; consultancy agreements with Almirall, Amgen, AstraZeneca, Boehringer Ingelheim, Chiesi, GlaxoSmithKline, Meda, Mundipharma, Napp, Novartis, Pfizer, Teva Pharmaceuticals, and Theravance; grants and unrestricted funding for investigator-initiated studies (conducted through OPRI) from Aerocrine, AKL Research and Development Ltd, AstraZeneca, Boehringer Ingelheim, British Lung Foundation, Chiesi, Meda, Mundipharma, Napp, Novartis, Pfizer, REG, Takeda, Teva Pharmaceuticals, Theravance, UK National Health Service, Zentiva; payment for lectures/speaking engagements from Almirall, AstraZeneca, Boehringer Ingelheim, Chiesi, Cipla, GlaxoSmithKline, Kyorin, Meda, Merck, Mundipharma, Novartis, Pfizer, Skyepharma, Takeda, and Teva Pharmaceuticals; payment for manuscript preparation from Mundipharma and Teva Pharmaceuticals; payment for the development of educational materials from Mundipharma and Novartis; payment for travel/accommodation/meeting expenses from Aerocrine, AstraZeneca, Boehringer Ingelheim, Mundipharma, Napp, Novartis, and Teva Pharmaceuticals; funding for patient enrolment or completion of research from Chiesi, Novartis, Teva Pharmaceuticals, and Zentiva; stock/stock options from AKL Research and Development Ltd, which produces phytopharmaceuticals; owns 74% of the social enterprise Optimum Patient Care Ltd, UK, and 74% of OPRI, Singapore; and is a peer reviewer for grant committees of the Efficacy and Mechanism Evaluation program, Health Technology Assessment, and Medical Research Council. DBP currently serves as Editor-in-Chief for Pragmatic and Observational Research. To be fully transparent and conform with COPE guidelines addressing an editor as author in own journal, the following procedures were implemented: 1) the addressee for the manuscript submission cover letter was journal editorial board member Professor Arora; 2) the manuscript peer review process was handled by journal editorial board member Dr John Haughney and was independent of the editor-in-chief (recognizing that it would not be possible to completely remove bias); and 3) the paper was sent out for review without any names included. The authors report no other conflicts of interest in this work. Global Asthma Network. The Global Asthma Report 2014. Auckland, New Zealand: Global Asthma Network; 2014. National Center for Environmental Health. Current Asthma Population Estimates – in Thousands by Age, United States: National Health Interview Survey. National Center for Environmental Health; 2015. Available from: https://www.cdc.gov/asthma/nhis/2013/table3-1.htm#modalIdString_CDCTable_0. Accessed April 28, 2017. National Center for Environmental Health. Asthma’s Impact on the Nation. Data from the CDC National Asthma Control Program. National Center for Environmental Health; 2015. Available from: https://www.cdc.gov/asthma/impacts_nation/asthmafactsheet.pdf. Accessed April 28, 2017. Sullivan PW, Ghushchyan VH, Slejko JF, Belozeroff V, Globe DR, Lin SL. The burden of adult asthma in the United States: evidence from the Medical Expenditure Panel Survey. J Allergy Clin Immunol. 2011;127(2):363–369. Eliseeva TI, Balabolkin II. Modern technologies of bronchial Asthma Control in Children (review). Modern Technologies of Bronchial Asthma Control in Children. 2015;7(2):168–178. Baker JW, Kemp J, Uryniak T, Silkoff PE. Asthma control in pediatric patients treated with once-daily or twice-daily nebulized budesonide inhalation suspension (Pulmicort Respules). Allergy Asthma Proc. 2008;29(3):280–285. Volovitz B, Bilavsky E, Nussinovitch M. Effectiveness of high repeated doses of inhaled budesonide or fluticasone in controlling acute asthma exacerbations in young children. J Asthma. 2008;45(7):561–567. Yanagida N, Tomikawa M, Shukuya A, Iguchi M, Ebisawa M. Budesonide inhalation suspension versus methylprednisolone for treatment of moderate bronchial asthma attacks. World Allergy Organ J. 2015;8(1):14. Szefler SJ, Baker JW, Uryniak T, Goldman M, Silkoff PE. Comparative study of budesonide inhalation suspension and montelukast in young children with mild persistent asthma. J Allergy Clin Immunol. 2007;120(5):1043–1050. Zeiger RS, Mauger D, Bacharier LB, et al. Daily or intermittent budesonide in preschool children with recurrent wheezing. N Engl J Med. 2011;365(21):1990–2001. Newswire PR [webpage on the Internet]. FDA Approves AstraZeneca’s New Asthma Medication for Children and Infants as Young as 12 Months. Pulmicort Respules™ – First and Only Nebulized Corticosteroid Therapy. 2000. Available from: http://www.prnewswire.com/news-releases/fda-approves-astrazenecas-new-asthma-medication-for-children-and-infants-as-young-as-12-months-72775962.html. Accessed August 17, 2016. Shapiro G, Mendelson L, Kraemer MJ, Cruz-Rivera M, Walton-Bowen K, Smith JA. Efficacy and safety of budesonide inhalation suspension (Pulmicort Respules) in young children with inhaled steroid-dependent, persistent asthma. J Allergy Clin Immunol. 1998;102(5):789–796. Leflein JG, Gawchik SM, Galant SP, et al. 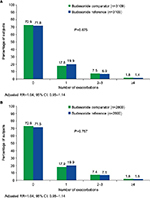 Safety of budesonide inhalation suspension (Pulmicort Respules) after up to 52 weeks of treatment in infants and young children with persistent asthma. Allergy Asthma Proc. 2001;22(6):359–366. Szefler SJ, Lyzell E, Fitzpatrick S, Cruz-Rivera M. Safety profile of budesonide inhalation suspension in the pediatric population: worldwide experience. Ann Allergy Asthma Immunol. 2004;93(1):83–90. Mellon M. Efficacy of budesonide inhalation suspension in infants and young children with persistent asthma. Budesonide Inhalation Suspension Study Group. J Allergy Clin Immunol. 1999;104(4 pt 2):191–199. Thomas V, Price D, Yau S, Mcdonald R, Chong C, Gefen E. Real-life effectiveness and safety of comparator budesonide inhalation suspension is noninferior to originator product for asthma patients [abstract]. Respirology. 2015;20(suppl S3):20. Budesonide suspension [prescribing information]. Sellersville, PA: Teva Pharmaceuticals USA; 2014. Rennard SI, Farmer SG. Exacerbations and progression of disease in asthma and chronic obstructive pulmonary disease. Proc Am Thorac Soc. 2004;1(2):88–92. Krishnan V, Diette GB, Rand CS, et al. Mortality in patients hospitalized for asthma exacerbations in the United States. Am J Respir Crit Care Med. 2006;174(6):633–638. Carrier E, Cunningham P. Medical cost burdens among nonelderly adults with asthma. Am J Manag Care. 2014;20(11):925–932. Colice G, Martin RJ, Israel E, et al. Asthma outcomes and costs of therapy with extrafine beclomethasone and fluticasone. J Allergy Clin Immunol. 2013;132(1):45–54. AstraZeneca UK Limited [webpage on the Internet]. Pulmicort Respules 0.5 mg [Summary of Product Characteristics]. Luton, UK: AstraZeneca UK Limited; 2015. Available at: http://www.medicines.org.uk/emc/medicine/193. Accessed August 17, 2016. Price D, Roche N, Christian VJ, et al. Device type and real-world effectiveness of asthma combination therapy: an observational study. Respir Med. 2011;105(10):1457–1466. Price D, Martin RJ, Barnes N, et al. Prescribing practices and asthma control with hydrofluoroalkane-beclomethasone and fluticasone: a real-world observational study. J Allergy Clin Immunol. 2010;126(3):511–518. Price D, Thomas M, Haughney J, et al. Real-life comparison of beclometasone dipropionate as an extrafine- or larger-particle formulation for asthma. Respir Med. 2013;107(7):987–1000. Calverley PM, Boonsawat W, Cseke Z, Zhong N, Peterson S, Olsson H. Maintenance therapy with budesonide and formoterol in chronic obstructive pulmonary disease. Eur Respir J. 2003;22(6):912–919. Szafranski W, Cukier A, Ramirez A, et al. Efficacy and safety of budesonide/formoterol in the management of chronic obstructive pulmonary disease. Eur Respir J. 2003;21(1):74–81. O’Byrne PM. Pharmacologic interventions to reduce the risk of asthma exacerbations. Proc Am Thorac Soc. 2004;1(2):105–108. Erickson SC, Le L, Ramsey SD, et al. Clinical and pharmacy utilization outcomes with brand to generic antiepileptic switches in patients with epilepsy. Epilepsia. 2011;52(7):1365–1371. Hartung DM, Middleton L, Svoboda L, McGregor JC. Generic substitution of lamotrigine among medicaid patients with diverse indications: a cohort-crossover study. CNS Drugs. 2012;26(8):707–716. Sicras-Mainar A, Rejas-Gutierrez J, Navarro-Artieda R. Comparative effectiveness and costs of generic and brand-name gabapentin and venlafaxine in patients with neuropathic pain or generalized anxiety disorder in Spain. Clinicoecon Outcomes Res. 2015;7:299–312. Song JW, Chung KC. Observational studies: cohort and case-control studies. Plast Reconstr Surg. 2010;126(6):2234–2242. Leflein JG, Szefler SJ, Murphy KR, et al. Nebulized budesonide inhalation suspension compared with cromolyn sodium nebulizer solution for asthma in young children: results of a randomized outcomes trial. Pediatrics. 2002;109(5):866–872. Matsunaga K, Hirano T, Oka A, et al. Progression of irreversible airflow limitation in asthma: correlation with severe exacerbations. J Allergy Clin Immunol. 2015;3(5):759–764. Dalglish G, Priestley G. Scientific respiratory symposium, Paris June 2010. J Asthma Allergy. 2011;4:61–76.